Clayton Superintendent Edmond Heatley Tries To Leave Clayton County. Was Not Invited Back For Second Interview In Dallas. Rejected. Dr. Trotter Says, “I Have Said All Along That These Guys Are Educational Sluts.” | Georgia Teachers Speak Out! 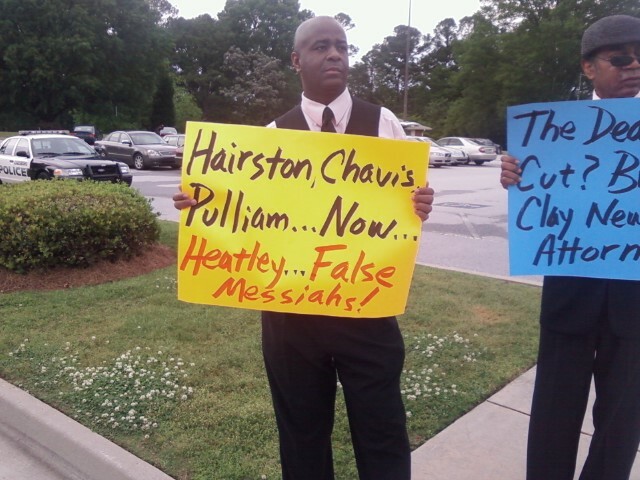 ← Dr. John Trotter Keeps Hammering Away At Clayton County Superintendent Edmond Heatley! Heatley has apparently been under immense pressure from the Clayton County Community over the budget process (even threatening to do away with middle school athletics), hiring procedures (much criticism about hiring fraternity cronies and family members), and doing some things without proper authorization from the school board. According to the published report in The Atlanta Journal-Constitution, Larry O’Keefe, an activist in the Clayton Community essentially says that Heatley and the Clayton County School Board‘s relationship is not so grand — as the public may think. It appears that obliquely critical words from board members — like Chairperson Pam Adamson — who have usually stood toe-to-toe with Heatley are not so subtly critical now. In fact, it appears to us that there are several muted tunes being played by board members. It might do Edmond Heatley well if he would continue to send out his resume to other unsuspecting school systems. We know that is would do the children, teachers, and citizens of Clayton County much good. Perhaps he ought to ask the folk at the Eli Broad Institute to work overtime finding another school board attorney to “pimp” him to another unsuspecting school board. Isn’t this what Marietta attorney Glenn Brock did to the Clayton County Board of Education? The Glenn Brock search firm seems to be known for bringing the likes of Michael Hinojosa, Robert Avossa, and Edmond Heatley to town. Hmm. Edmond Heatley is officially awarded our Superintendent Clown Award. Congratulations, Mr. Heatley. You are only the third official recipient of this coveted award. Crawford Lewis, formerly of DeKalb County, was given this award in 2009 before his criminal indictment, and Jerry Bell of Hart County is the most recent recipient of this award. You join an exclusive club for being a clown of a superintendent! Now that the Chief clown is job hunting I think he needs some additional incentive to keep trucking like firing! Gone: Just like the people of Chino Valley, California were apparently hoping that Edmond Heatley would get on in Clayton County, I am confident that most of the people associated with the school system in Clayton County are hoping that some other unsuspecting school system would buy his bill of goods, so to speak. I am reading up on this prospect now targeted for Commissioner of Education in Bermuda. If the claims made are true, then the children of Bermuda, you are saying, are at GREATER RISK. If the people Bermuda are considering Edmond Heatley for Commissioner of Education, then may the Good Lord have special mercy upon them. Dr. Trotter, has this desire/interview been confirmed by Superintendent Heatley as valid? Has he replied as to reasons for a desired departure? Since 2001 this system has been on a downward spiral due to the top level bickering and the terroistic leadership of several board members. This led to the loss of accreditation and the loss of quality staff. The current board continues to turn a blind eye to the lack of academic achievement under their favored superintendent but all of the blame is placed squarely on the shoulders of the people who repeatedly held this system together through all of its battles, the teachers. Before pointing a finger at them educate yourselves on what power and control they have over curriculum, instruction, demographics, culture and lastly the most powerful performance indicator in any system, politics then you will find who is utimately responsible. The taxpayers of this county who continually allow their board members to ignore what isn’t happening in the system and allow the superintendent to garner his salary, benefits plus his entire family to do so also is once again disgraceful. I submitted a post last week requesting that perhaps the News-Daily should request records from the system on the number of teachers that have left since 2003 and compare that data to the budget cuts for those years along with the academic performance of the system. I think the taxpayers need to see the trend clearly so that they can make informed decisions during the next election. As a former educator in the system it was tough to go to places for training and state that you were from Clayton during the entire debacle from 2003 to present, at that time our peers from other systems would tell us they were praying for us and we asked them to do so continually. We cried on the day the loss of accreditation was announced and we still worked hard to hold things together for our students and to honor the trust the taxpayers had given us. Repeatedly these boards have thrust these “miracle worker” superintendents upon us who come in with agendas to make a name for themselves and support their friends and family. The successful systems in the metro area have one thing in common, they don’t bring outsiders in. Clayton’s board chose Edmond Heatley over Sam King, go figure that. The taxpayers are getting just desserts at this point, if you pole the teachers and staff of the schools your children attend most likely they will all have the same response, “I would rather not comment ” or they simply give you a big company answer out of fear. Well the one thing they definitely need to know at this point is that quality educators continue to leave Clayton, why, well out of sheer frustration! A year or so ago Clayton had the highest number of educators with discipline issues, why who else wants to work in a system where you have people like DE (uninformed Commentor in Clayton News Daily) that can see the forest but prefers to blame the trees. The forest is your board, get them in check and demand they hire quality leadership! Gone: You hit on so many true things about Clayton County! Chavis, Pulliam, Thompson, and now Heatley. Terrible superintendents! EVERYBODY KNOWS that “sluts” are of no economic significance to themselves without “pimps.” Where would “sluts” like Heatley be without “pimps” like Glenn Brock? Of course, GB would do more-than-enough damage to GAPubEd were “pimping” “sluts” the only “educational” thing he did. GB, like his colleagues who are “serving” the DCSS in their legal travails(to the tune of $30M-plus dollars over the last three years), is getting rich as a school board attorney. But does anyone think that GB and the DCSS-“serving” shysters are the only attorneys “doing well” off of GAPubEd? How about the attorney representing the school board in My Hometown, Augusta? His firm has been paid over $4M in the 8-year-period from FY04 through FY11. The 4-mill doesn’t include “finder’s fees” from ATL law firms associated by the RCBOE attorney to handle bond issuances. Most distressingly, the RCSS has some of the worst school- and classroom- climate/student discipline issues you’ll find. Oh, well, it’s only taxpayers’ money. Dr. Craig: Don’t get me started on the “pimping” of school board attorneys! You know what I think of them! Ha! I feel sorry for the children, parents, and educators of Bermuda. Bermuda had always had a good reputation public education. Heatley, in my opinion, will be a complete disaster.